I'm aware that this write-up is already sounding like a hype-drenched press release, but the truth is that from a critical perspective I was honestly shocked at how much fun Duck Game is when compared to its obvious peers. Although I fully appreciate both the beauty and design of TowerFall, something about the game never quite gelled with me. Maybe it was the fact that when playing against veteran or experienced players it was difficult to ever get the upper hand? Perhaps it was the limited scope for strategic play within the single-screen arenas, or maybe it was simply the fact it felt so clean, polished and pretty much devoid of silliness? 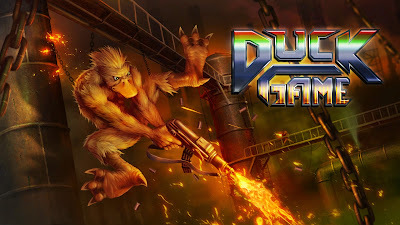 Regardless, I approached Duck Game in pretty much the same mindset, thinking that I knew what to expect from a multiplayer combat game, yet as soon as I hit the Start (*cough*, I mean the 'Ouya') button on the title screen the surprises began. 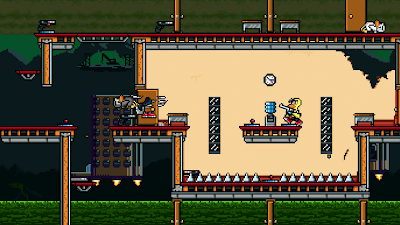 The fun in Duck Game starts immediately. 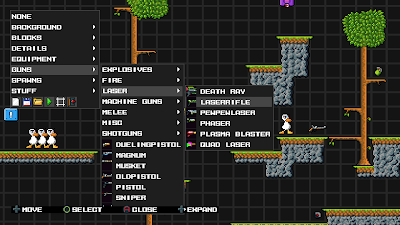 Instead of a typical menu system, you navigate your duck around a single screen from which the game options, level editor, profiles and multiplayer set-up are accessible. And then upon starting a multiplayer game, each active player begins in a small room from which they can select their team and profile before grabbing a shotgun and following the tongue-in-cheek sign that directs you to 'break glass in case of war'. 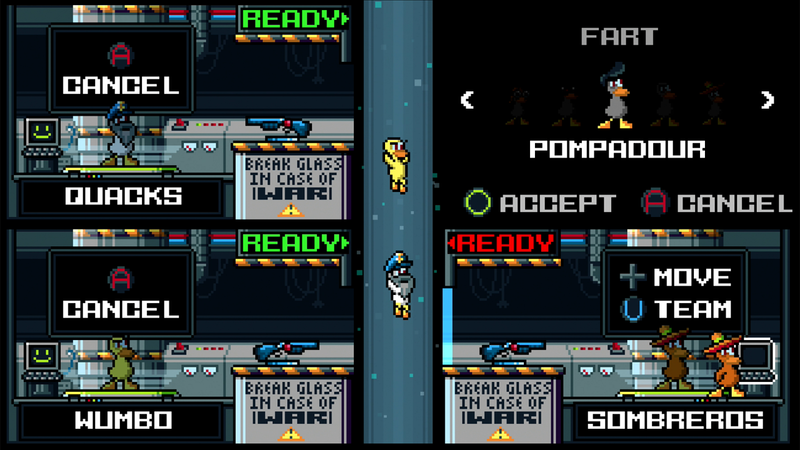 In reality, this selection screen serves as both a tutorial and a chaotic appetizer for the main course to follow, with ducks randomly firing and throwing their shotguns around the confines of their start rooms, trying on a variety of Ouya themed hats and quacking insults at each other before leaping into the central teleporter and beginning the game proper. With 50 randomly selected arenas, two dozen weapon types and destructible/throwable scenery, Duck Game triumphs over TowerFall in several key areas. First of all, similar to Boneloaf's acclaimed party game Gang Beasts, every player, experienced or not, has a fair chance of victory thanks to the hilariously clunky, low-ammunition weapons that can often result in the demise of the hunter as well as the prey. In fact, in many cases the victor is often the player who does nothing but wait at the spawn point whilst the others duke it out in ferocious close combat, setting themselves and each other on fire with flamethrowers or blasting everyone to hell by forgetting to lob an accidentally armed grenade. Then there's the sheer variety on offer; be it the weapons and pick ups, the environment, the interactive objects and scenery, Duck Game is full of surprises and it'll be some time until I've discovered all of its secrets. Some of the more memorable moments include a level in which all the guns are hidden within wrapped presents behind locked doors. 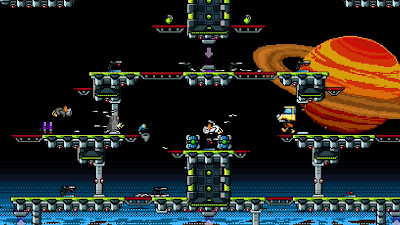 Another where the arena is a network of portals and teleporters, in which a well timed shot can kill multiple opponents in completely opposite ends of the level. There's even a room full of wieldable and playable musical instruments that have no function other than being a silly distraction. 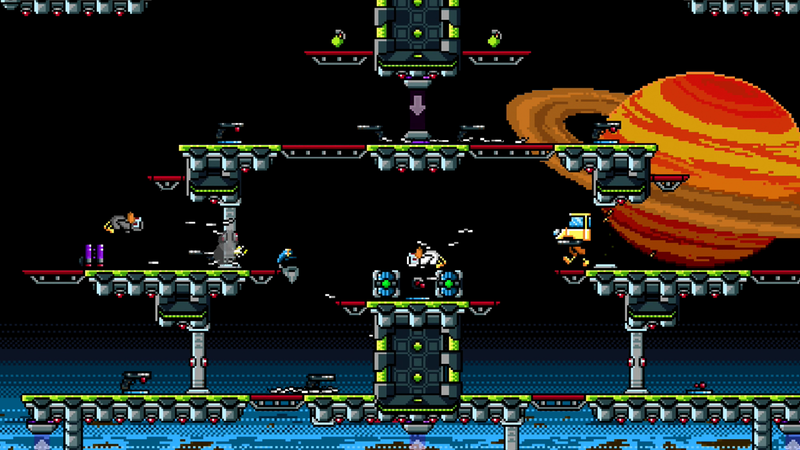 Oh, and not forgetting levels that feature jetpacks and miniguns, others where the only weapons are swords and hammers and one particularly hilarious arena where every wall and floor is covered in jump pads, resulting in grenades and ducks flying around everywhere like they are trapped within some sort of dangerously insane and incendiary pinball table. Most of all though, it's the war stories where Duck Game comes out on top. That time where you accidentally killed everyone by inadvertently throwing a sword Nidhogg-style whilst vainly attempting to equip a piece of armour. When you knocked that duck with a fearsome BFG off the map via a well-timed shot of a harmless nerf gun. Or what about the level where a flamethrower attack went wrong and the whole screen caught fire, suddenly rendering your previously useless extinguisher as the most desirable and useful item on the map? Sure, TowerFall has its moments, but even the excellent and much-acclaimed replay feature is surpassed by the goofy fake sports report that follows each match of Duck Game, complete with highlights and overall excitement/coolness ratings for the player's performance and the rounds in general. 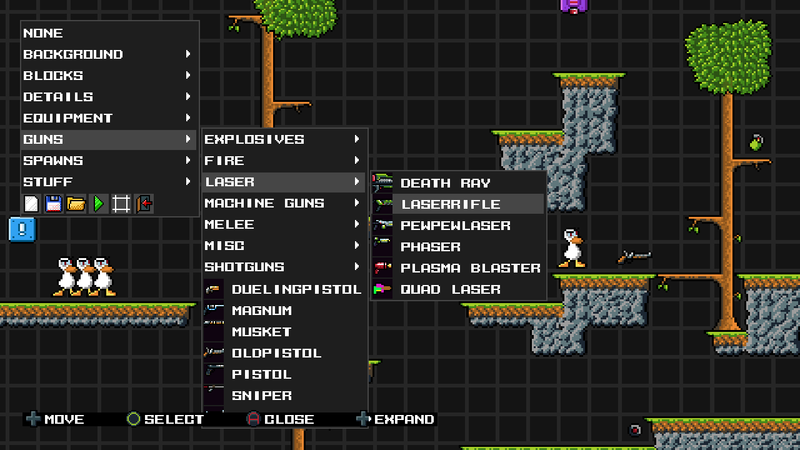 The addition of an in-game editor is the final big plus point Duck Game has going for it, which although tricky and non-intuitive to use with a controller, offers the opportunity for players to customise and experiment with their own battlefields. However, seeing that the Ouya is unlike other consoles in that you can simply plug in a micro USB cable or stick and transfer over data, having a standalone PC based editor might have been a better and arguably more productive option. I for one have no intention, despite how fun the end result could be, of sitting in my lounge in front of the TV and attempting to build levels without the use of a keyboard and mouse. Typically, Ouya are remaining silent with regard to what exclusivity deal they've secured with Landon, and there is no news as to whether or not the game will ever be available on any other formats. Somewhat surprisingly, at the end of the day of release the game had only secured a handful of ratings on the Ouya's Discover store, perhaps due to the lack of a free-to-try element or relatively high price point rather than being indicative of a low number of players - but even so, there is no doubt that Duck Game has the potential to match or surpass TowerFall's success, be it on the Ouya or ultimately elsewhere. Is Duck Game worth spending over $100 for? On its own, probably not, but if you already have an Ouya (aka Duck Game box), you should definitely consider spending a few dollars on their store for the game. For those of you on the fence regarding the console, Duck Game is simply another plus that the Ouya now has in its arsenal, in addition to being a simple to configure media centre, emulator box and indie-game wonderland. Oh, and for the haters still banging on about the Ouya controllers and Bluetooth lag, just grab a powered USB hub and plug in a few wired Xbox 360 pads. You won't regret it.